Prior to this I put together a collection of video and written reviews for the lower-cost Titan T-2 rack. But the T-3 rack, ie: the “HD” model, has surpassed the T-2 in popularity, despite the extra $100 price tag. These are both full power racks, in contrast to squat racks. Before we get to the reviews, let’s put everything on context. As you may know, the lower the number, the thicker the wall. This is 11 gauge, which is very good and what you see on high-end power racks. Titan doesn’t give a steel gauge rating of the T-2, but I’ve been at this long enough that I know it’s 14-gauge. It’s the same weight as the similarly constructed Best Fitness Power Rack. Upgraded from 2″x2″ to 2″x3″ tubing. This adds extra stability and resistance to swaying/wobbling. 1.25″ on the front, and instead of the typical tubing brace on the top rear, they put a thick 2″ pull up bar for the real masochists who don’t like pull ups to be easy. So with all this, the T-3 HD is probably the lowest-priced mid-range power rack right now. 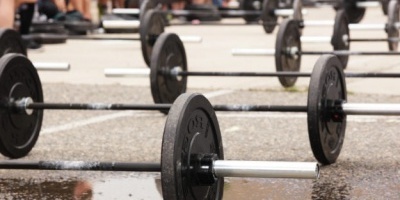 There’s only so many ways you can make a power rack. These two racks do look similar at first glance, but they’re not exactly the same. Both the quality and features are different. Some features are actually in Titan’s favor, because it isn’t the same rack. The reason I’m bringing up the Rogue R-3 here is, well, #1, Rogue is the biggest brand out there, and #2, this video comparing them has 65,000 views. It’s worth discussing what has changed since then, rather than just ignoring the video, which was very well done and on point to the design defects the Titan had at the time. The Rogue R-3 is a higher-quality rack in most respects. It’s also nearly double the price. The Rogue R-3 is actually available in a welded and bolted version, but the video shows the welded version. So what we’re looking at here is two racks that look very similar at first glance, and then when you get down to it you can find all the reasons the Rogue costs so much more. Is it worth it? The reviewer in the video above preferred the Rogue. If you can spend the money, sure, go for the Rogue. You’ll love it. Titan’s selling point is they have unbeatable prices for what you get. Titan’s 1″ hole spacing on the uprights goes a little higher than the Rogue. So this is a +1 in Titan’s favor, despite it being a cheaper rack. Rogue’s holes are tighter. The J cups and safeties have some slop on the Titan. 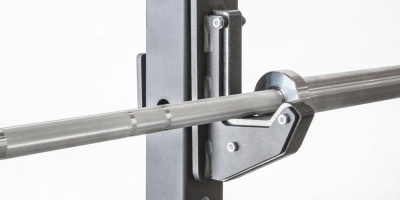 Titan’s 1.25″ and 2″ pull up bars are two separate pieces, placed in the front and back of the rack. Rogue’s are together, all one piece, placed more centrally. Titan includes plate storage posts. But on a rack like this it doesn’t make a lot of sense, because the plates stored on them can get in the way of the plates on your bar. I would just toss them. Titan also has optional $30 dip bars. Rogue doesn’t, surprisingly enough since it’s kind of a popular attachment. Rogue is made in the USA. Pin Pipe Safeties – Those stupid washers were removed from the design. Now it works like it’s supposed to. J Cups – No more crappy rubber inserts. UHMW inserts preinstalled. The J cups themselves have rounded edges. Much better. Welding – Feet not sitting flat is not acceptable. The welds are done better now. Dimpling – The holes aren’t punched anymore, so no more dimples around them! Powder Coating – Less prone to scratches than the enamel. Thicker Connectors – The connector plates are a thicker gauge steel. So that softens the tone of the comparison. As it is now, the Titan has become more reasonable as a cheap alternative than it was with the early version. This is a pretty thorough 1080p video of all the parts, installation and the finished assembly. You can see all the improvements as mentioned above. Don’t worry, he starts talking a minute into it. Just give him a moment. Still some issues with the sloppy fit of the J cups and safeties, and some scratches, but the owner is happy with it. He clearly knows his way around a rack and checks things out pretty well. As you can see, the rack doesn’t move when he re-racks 245 lbs. I guess I haven’t mentioned it yet, but this rack is supposed to be bolted to the concrete floor. Yep, you gotta mess up your concrete by drilling anchors in. That’s just the way it goes with any rack with this design that doesn’t have horizontal pieces connecting the left and right side. Once you mount it, it’s more stable than any unmounted rack, and for that reason some gym owners and even home gym owners will ONLY buy floor mounted racks. If it didn’t have great Amazon reviews, I wouldn’t even have bothered writing this article. 4.3 out of 5 stars. Titan’s site of course has great reviews for it. I don’t think people put a lot of trust into the ratings on a manufacturer’s own site, or most other stores, because negative reviews can be deleted. We all pretty much know that Amazon publishes and keeps all reviews that are halfway appropriate, positive or negative. Reputable third party review services also can work great, because they will not remove negative reviews at the store’s request. The store’s only option is to just not show any of the reviews anymore. And that’s about all I could find as far as hands-on reviews of the current model. Bodybuilding.com has some forum discussions, but anything in-depth is about the old versions with the problems that have been addressed. Alex at King of the Gym also did a comprehensive look at the T-3, with all its variations and several attachments. This rack is available from Titan Fitness for . They also have a deeper 36″ inside depth version for .